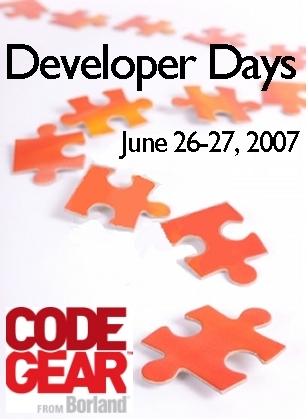 Abstract: Join us online for 2 free exciting Developer Days, June 26 (Tuesday) and 27 (Wednesday), where you will get technical insight straight from CodeGear team members into the new release of C++Builder® 2007, Delphi® 2007, Delphi® for PHP and InterBase®. With more than 23 years of revolutionizing the programming world and with more than 3 million customers worldwide, CodeGear is 100% dedicated to developers and the developer tools market, providing innovative products that maximize developer productivity. Join us online for 2 free exciting Developer Days where you will get technical insight straight from CodeGear team members into the new release of C++Builder® 2007, Delphi® 2007, Delphi® for PHP and InterBase®. Attendees must sign-up to participate prior to the event start time. Presentation recordings will be made available on the CodeGear Developer Network after Developer Days have concluded. Recordings of live Q&A sessions may not be provided. All times are listed as Pacific Daylight Time (PDT). To determine your local equivalent, you might try using time and date.com. PDT is 7 hours behind Coordinated Universal Time (UTC). * Agenda is subject to change without notice. I heard yesterday that the sound quality was bad (I didn't connect, as it was C++-oriented, but I will today). Can the sound be improved? On the registration page, it states that supported browsers are IE6+ and Firefox 2, so make up your minds. Using Firefox and cannot register either. Clearly a pointless exercise. Are the sessions/parts of the sessions going to be available for download after the event? I would like to know the topics which are going to be discussed during the two hour delphi 2007 session. thnx. No JBuilder sessions ???? Why ? Seeems that JBuilder has no more future in CodeGear: confirm or not !